The hearing quickly turned contentious as the committee chairman, Representative Jerrold Nadler, pressed Mr. Whitaker for details about when he had been briefed about the special counsel investigation and the acting attorney general refused to answer — and, at one point, told Mr. Nadler his five minutes of questioning time were up. It’s one of many actions that Mr. Nadler said raised important questions about why President Trump chose Mr. Whitaker to run the department: Why did the president get rid of Mr. Sessions? Why did Mr. Whitaker choose to oversee an investigation that could harm Mr. Trump? And what does Mr. Trump hope to get from Mr. Whitaker’s leadership? Representative Doug Collins of Georgia, the ranking Republican on the committee, angrily attacked Democrats in his opening statement, saying that they were interested in carrying out a “character assassination” of Mr. Whitaker and damaging Mr. Trump, not carrying out oversight of the Department of Justice. Mr. Collins noted that Mr. Nadler had promised not to issue a subpoena to Mr. Whitaker on Friday, saying Democrats had played a “hide and seek game” in securing permission on Thursday to subpoena Mr. Whitaker. And, noting that Mr. Barr would probably be attorney general by the end of next week, he said Democrat were just interested in having a “show” for partisan purposes. After accusing Mr. Nadler of wasting time, Mr. Collins ended his fiery opening remarks by calling for the committee to adjourn. Mr. Nadler objected, but the request forced a committee vote to keep the hearing going before Mr. Whitaker was even sworn in. Welcome to the Hill. Now about those documents. Democrats’ antagonizing of Mr. Whitaker began before he was even in the hearing room on Friday. Four Democratic committee chairmen, including Mr. Nadler of the Judiciary Committee, released a letter they sent Mr. Whitaker on Thursday raising new questions about his work for a Florida company, World Patent Marketing, which is accused of defrauding customers. Mr. Whitaker, they said, had ignored their earlier requests for information. And new information obtained by the House indicated the Mr. Whitaker had not returned funds he had been paid by the company, which the chairmen said it had requested be returned to pay victims of the fraud. A federal judge shut the company down last year and fined it nearly $26 million. Mr. Whitaker tried to set the tone for the back and forth with lawmakers by saying in his opening statement that he would not answer questions about his conversations with President Trump. Otherwise there are few surprises in his opening remarks, which nod to the work that his predecessor, Jeff Sessions, undertook to make the department’s top priorities fighting crime, cracking down on drugs and a zero-tolerance policy for illegal immigration. Democrats had told Mr. Whitaker that they would ask him to describe his conversations with Mr. Trump about the Russia inquiry, and had warned him that they would not accept his refusal to answer on the grounds that Mr. Trump might want to later invoke executive privilege to shield that information from Congress. The Justice Department, noting that such disputes are usually resolved through negotiation and accommodation, has said that Mr. Nadler promised on Thursday not to subpoena Mr. Whitaker — who is appearing voluntarily before the panel — on Friday. A subpoena would be the first step toward citing him for contempt of Congress for refusing to answer questions. Mr. Trump has persistently and colorfully denied that he coordinated with Russia to sway the 2016 election since he took office. But he was given a new arrow for his quiver this week by Senate investigators, and wasted no time shooting it off. “The mainstream media has refused to cover the fact that the head of the VERY important Senate Intelligence Committee, after two years of intensive study and access to Intelligence that only they could get, just stated that they have found NO COLLUSION between “Trump” & Russia,” he wrote on Twitter. The committee has been investigating Russia’s election campaign for two years now, and has interviewed hundreds of witnesses. Mr. Burr’s comments came just a day after Democrats running the House Intelligence Committee reopened a broad Russia investigation. 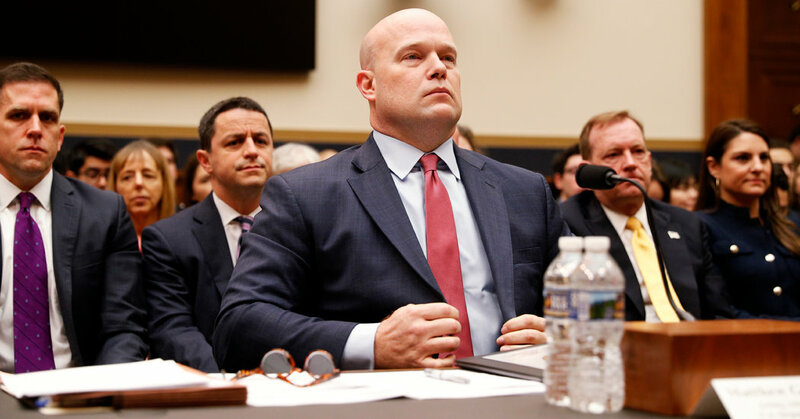 Matthew G. Whitaker, the acting attorney general, comes before the House Judiciary Committee this morning for what is expected to be a contentious oversight hearing. His appearance followed a last-minute fight on Thursday in which he threatened to pull out over worries that Democrats would move to cite him for contempt in the midst of the hearing. Led by the Judiciary Committee chairman, Representative Jerrold Nadler of New York, Democrats have made a priority of bringing Mr. Whitaker before their panel in an early exercise of their new powers after they regained control of the House in the midterm elections. President Trump installed Mr. Whitaker, widely seen as a White House loyalist as the nation’s top law enforcement official in November after he fired Jeff Sessions, the former attorney general, a day after the November election. Rejecting the advice of ethics officials that he recuse himself from overseeing Trump-Russia investigation, Mr. Whitaker then moved to take over supervision of the special counsel, Robert S. Mueller III. Mr. Whitaker’s appointment sidestepped the normal order of succession at the department, under which Rod J. Rosenstein, the Senate-confirmed deputy attorney general who had previously overseen the Russia investigation, would have temporarily taken over leadership responsibilities. Some Democrats have challenged his appointment as illegitimate; in the interim, Mr. Trump has nominated William P. Barr for the role, but he is not yet confirmed. Knife crime: Can Chicago’s model cure London’s violence? September 21, 2018 Comments Off on Knife crime: Can Chicago’s model cure London’s violence?